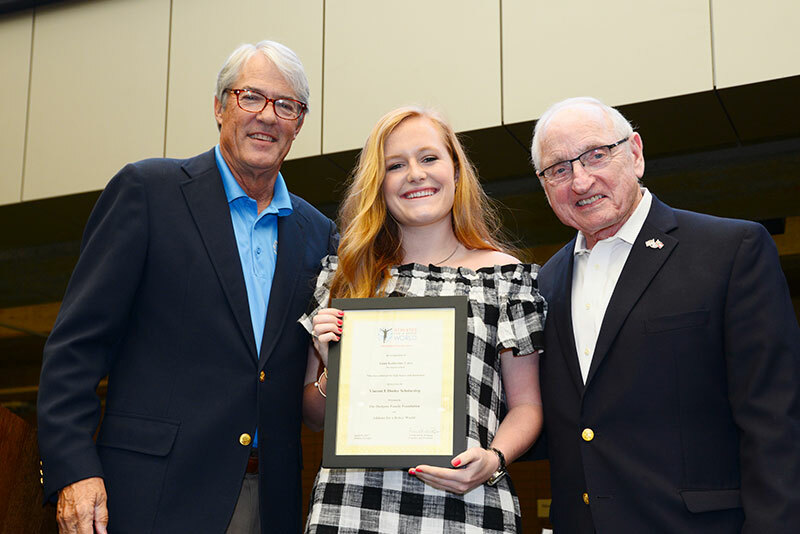 Sadie Frame of First Presbyterian Day School, and Wesley Simpson of Union Grove High School were named as the recipients of the four-year scholarship of $1000 per year by legendary Coach Vince Dooley on May 12, 2018 at a ceremony held at the College Football Hall of Fame in Atlanta. More than 550 student-athletes and guests attended the event which featured inspirational messages from Coach Dooley, Executive Director of the Georgia High School Association Dr. Robin Hines, and ABW Founder/President Fred Northup. All enjoyed a breakfast meal, compliments of The Chick-fil-A Foundation. 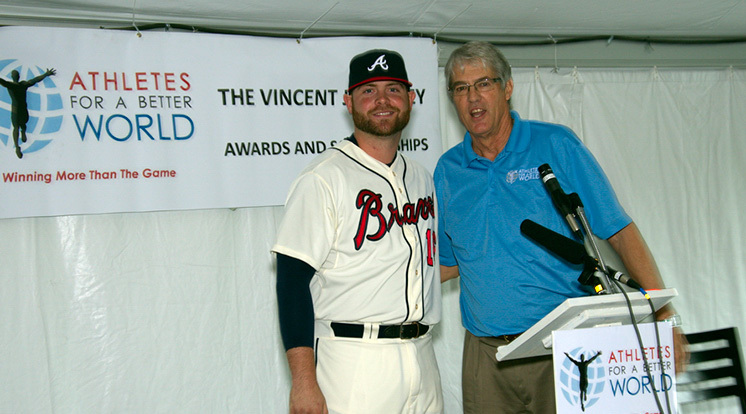 The Hudgens Family Foundation was once again the Presenting Sponsor for the event. 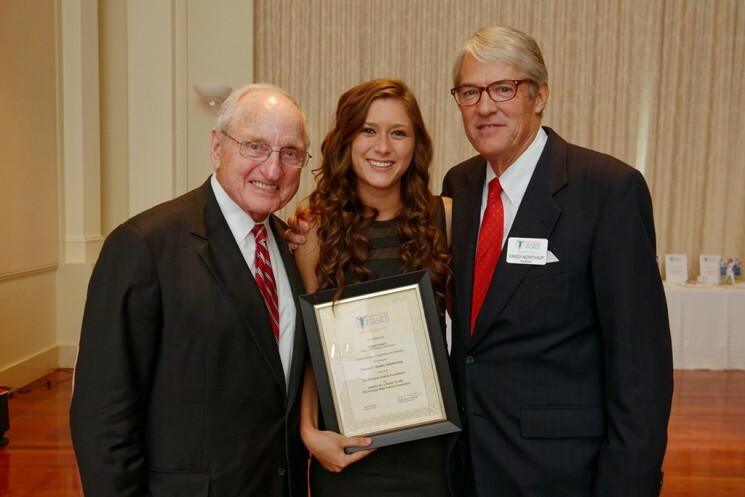 Anna Katherine Cates of Darlington School, and Noah Shepard were named as the recipients of the four-year scholarship of $1000 per year by legendary Coach Vince Dooley on April 29, 2017 at a ceremony held at the College Football Hall of Fame in Atlanta. 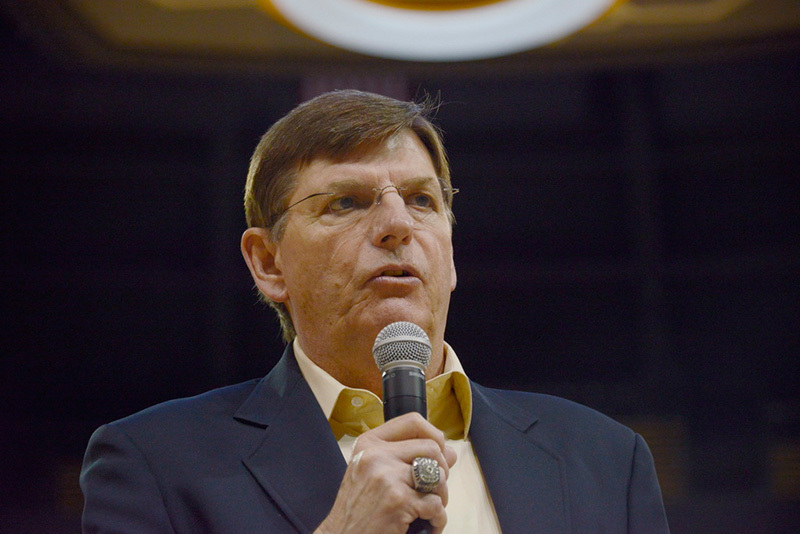 Nearly 300 student-athletes and guests attended the event which featured inspirational messages from Coach Dooley, ABW Founder/President Fred Northup, and Atlanta Public Schools’ Assistant Director of Athletics Kandice Mitchell. In attendance was last year’s speaker and special guest Carror Wright of the Georgia High School Association. All enjoyed a breakfast meal, compliments of Chick-fil-A. The Hudgens Family Foundation was once again the Presenting Sponsor for the event. 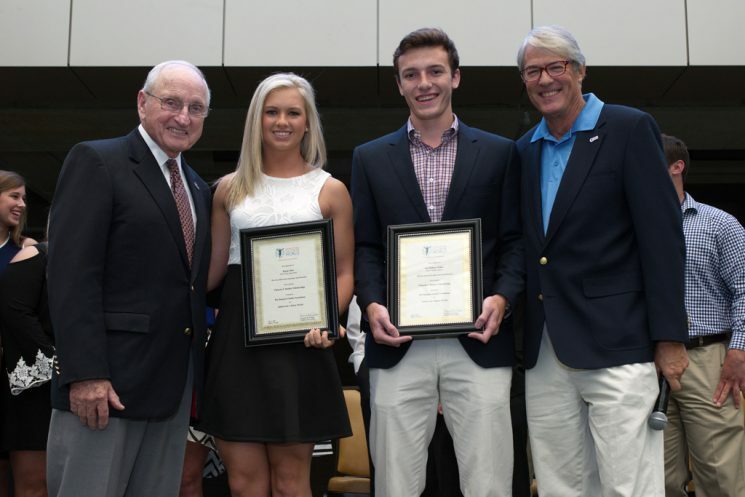 Regan Sikes of Pierce County High School, and Jack McRae III of Grace Christian Academy were named as the recipients of the four-year scholarship of $1000 per year by legendary Coach Vince Dooley on May 7, 2016 at a lunch ceremony held at the College Football Hall of Fame in Atlanta. 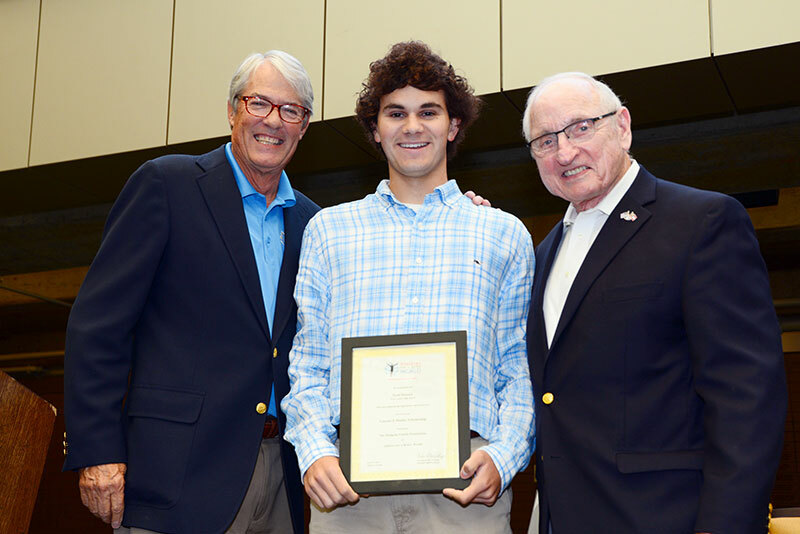 Nearly 500 student-athletes and guests attended the event which featured inspirational messages from Coach Dooley, ABW Founder/President Fred Northup, and Carror Wright of the Georgia High School Association. All guests enjoyed a self-guided tour of the Hall, compliments of the Chick-fil-A Foundation. The Scott Hudgens Foundation was once again the Presenting Sponsor for the event. 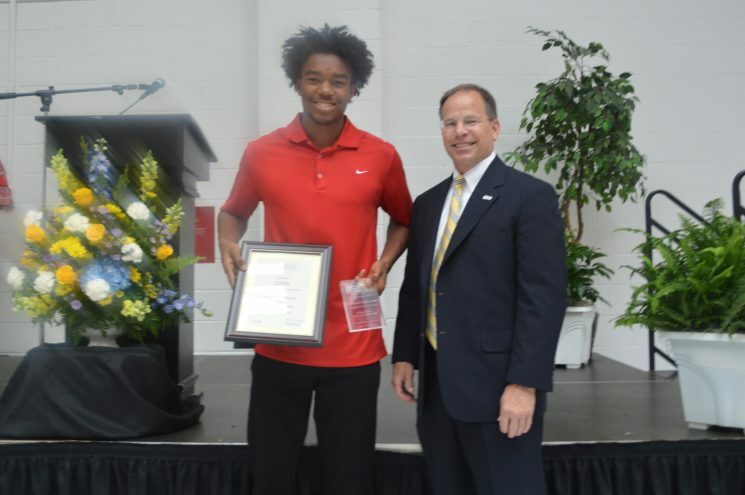 Ms. Sikes distinguished herself in and out of the classroom by achieving a 4.0 average while lettering in tennis, track, and softball, the latter pursuit earning her Player of the Year honors in Region 1AAA. Regan participates in CureSearch cancer walks, mission trips to the Dominican Republic, Special Olympics, and Sycamore Tree for those in need. She was elected Class President, is Secretary of the First Southern Bank Junior Board of Directors, and was chosen to be a delegate for the REMC Washington DC Youth Tour. 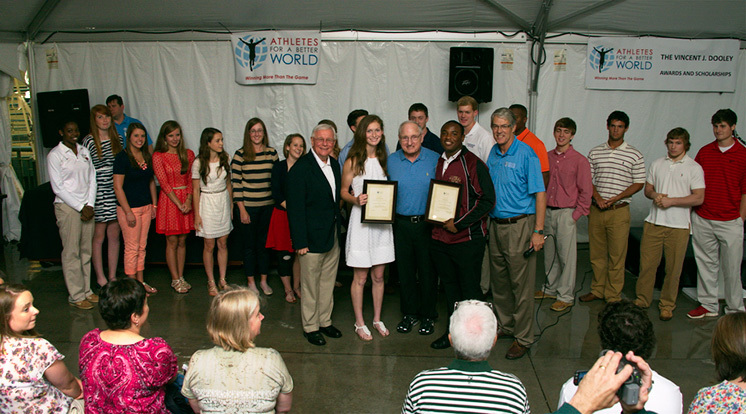 Regan selected Mattie’s Mission in Waycross, Georgia as her recipient of a $500 donation from Athletes for a Better World as a part of the Dooley Scholarship. She will attend Armstrong Atlantic University. 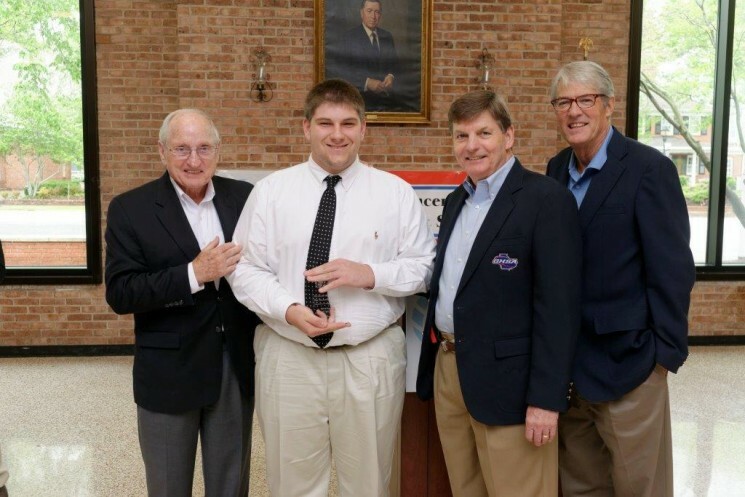 Mr. McRae is his school’s all-time leading scorer in basketball, and also excelled at soccer, tennis, and track. 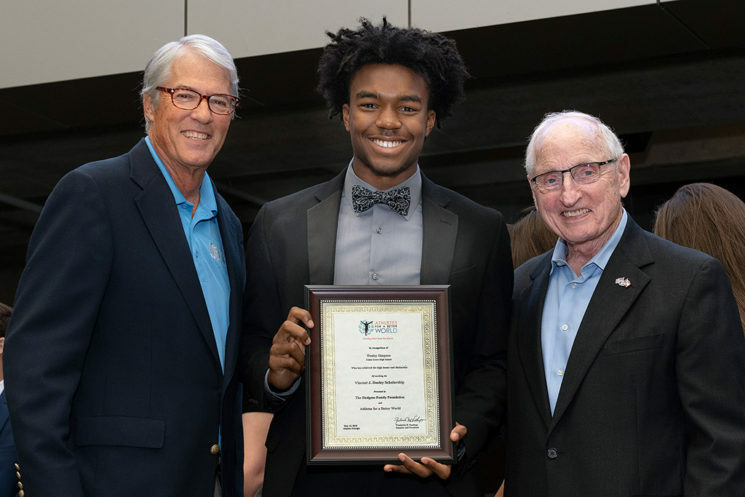 This 4.0 Valedictorian extended his passion for science by completing an internship at Florida State’s Biomedical program, helping him to earn an award from the Congress of Future Medical Leaders in Washington, DC. His DAR Good Citizen Award by a faculty vote was a result of numerous clothing and food drives, as well as tutoring young students of migrant workers. Jack’s selfless charity work was again rewarded by being named as a recipient of the President’s Volunteer Service Award, Washington, DC. 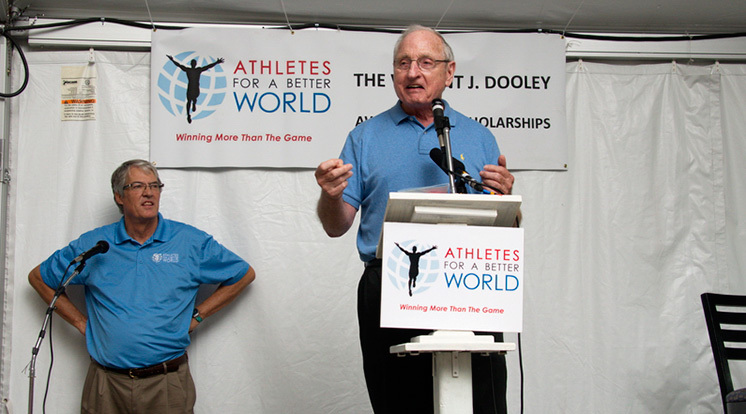 He has designated Friendship House of Jesus in Bainbridge, Georgia as his recipient of a $500 donation from Athletes for a Better World as a part of the Dooley Scholarship. Jack will attend the University of Georgia. Adairsville High School Salvador Kenneth Grimaldo, Jr.
Abbi Mabry of Lakeview/Fort Oglethorpe High School and Blake Carter of Tattnall County High School were named as the recipients of the four-year scholarship by Coach Dooley on April 18. Abbi’s stellar high school multi-sport career included being named Valedictorian, the State of Georgia recipient of the Wendy’s High School Heisman, contributor locally to Habitat for Humanity, and as a teacher’s aide to students with special needs. She will declare a pre-med major as will her co-winner, Blake Carter, who distinguished himself in two sports while acting as Senior Class President, President of the Future Business Leaders of America, and President of the Tattnall County Chamber of Commerce Junior Board. Carter’s projects on the Board include blood drives, food drives, and elder care. 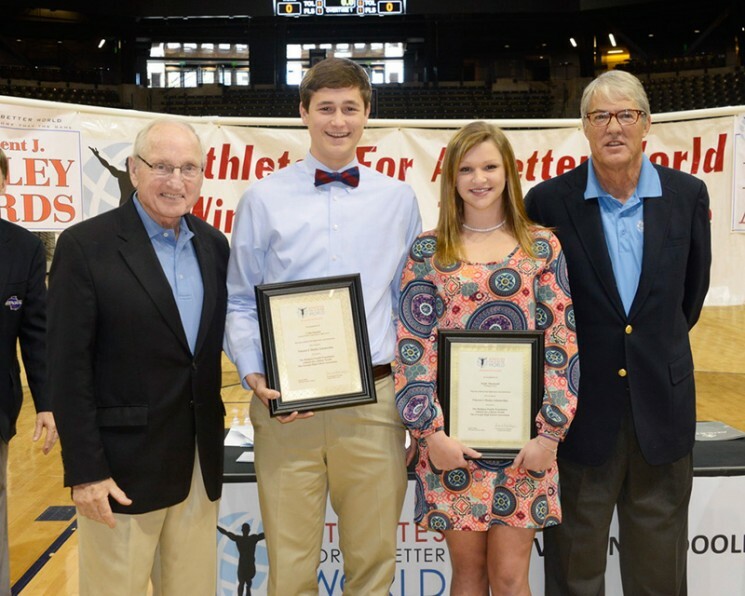 Emily Thurmond of Darlington School and Colin Humble of George Walton High School were named as the recipients of the four year scholarships by Coach Dooley at the Awards ceremony on April 5. 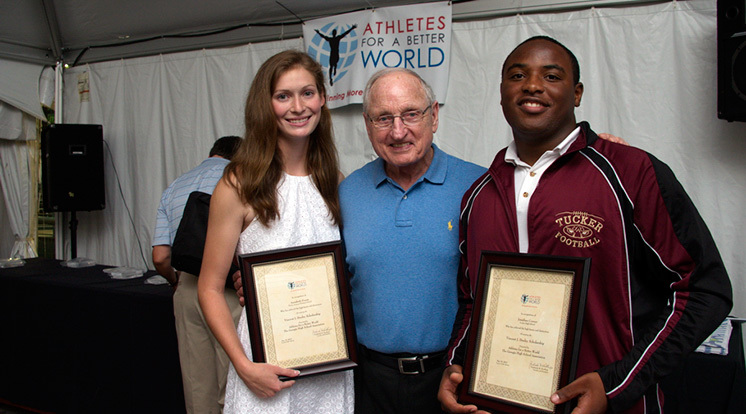 Both recipients had very distinguished high school careers. In particular it was noted that Emily had begun a program of raising money for musical instruments for mentally challenged students in a nearby school, and Colin had begun a Christmas program for the homeless that led to an ongoing program of groceries, meals twice a week, and a bicycle restoration project for the homeless. Annabeth Pruett of Prince Avenue Christian School and Jonathan Conner of Tucker High School were announced as the recipients of the four year $1,000 a year scholarships at Turner Field. Over 500 people braved the rains to be present as Award recipients from the High Schools of Georgia were recognized for their outstanding character and leadership. 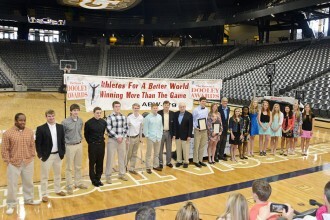 “These are the most outstanding young people in the state of Georgia,” said Fred Northup of ABW, “and each person is within arm’s reach of a Class President, captain of a sport, the President of the Student Body, head of the Beta Society, Head of the Honor Society or countless other honors that have led their school to recognize these young people as the most outstanding young person in their school.” A complete list of all those honored is below the pictures. Savannah Smith, George Walton Academy .